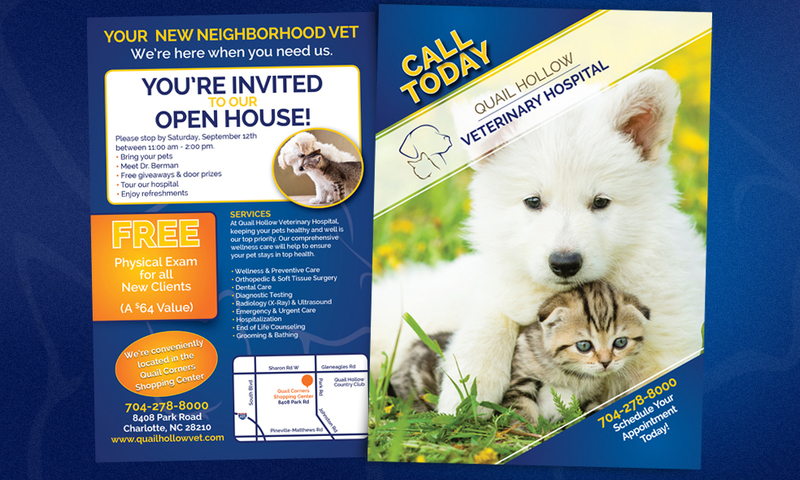 Welcome to our EDDM Spotlight Client – Quail Hollow Veterinary Hospital! Contacting ummhumm | creative studio to create an EDDM® or Every Door Direct Mail®, Quail Hollow Veterinary Hospital wanted to announce their emergence into the neighborhood. 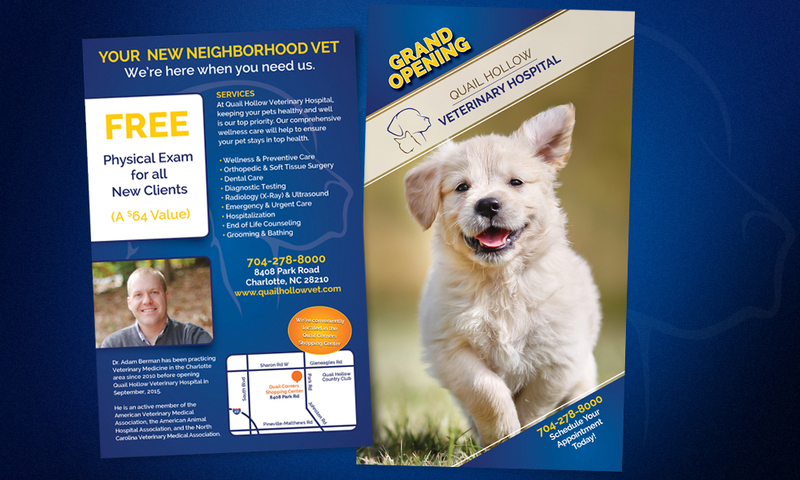 Based in Charlotte, NC, we wanted to provide the new veterinarian, Dr. Adam Berman, with a visually appealing design that would capture eyeballs and drive customers to his new facility. We decided that a horizontal 6.25 x 11 mailer would be the best way to cut through the junk in your mailboxes. A fluffy little golden retriever pup was the clear winner for the front cover, while the back utilized contrasting colors to gain attention. The initial mailer was so successful, QHVH contracted ummhumm | creative studio to create 3 more mailers, seen below. 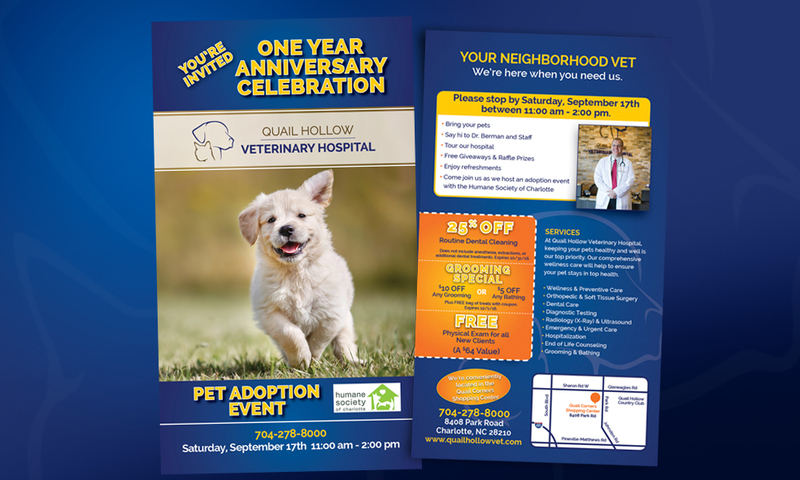 We wish Quail Hollow Veterinary Hospital all the best in their practice and hope to continue our creative relationship in helping them grow their business! If you’re in the Charlotte area, definitely send your litter critters their way! Dr. Adam Berman was raised in North Carolina and has always had a passion for animals. He received his Bachelor of Science (BS) in Animal Science from North Carolina State University in 2004. He then went on to receive his Doctorate in Veterinary Medicine (DVM) from the College of Veterinary Medicine at North Caroline State University in 2010. Dr. Berman has practiced in the Charlotte area since 2010 at several hospitals including TotalBond Veterinary Hospitals and Dilworth Animal Hospital. 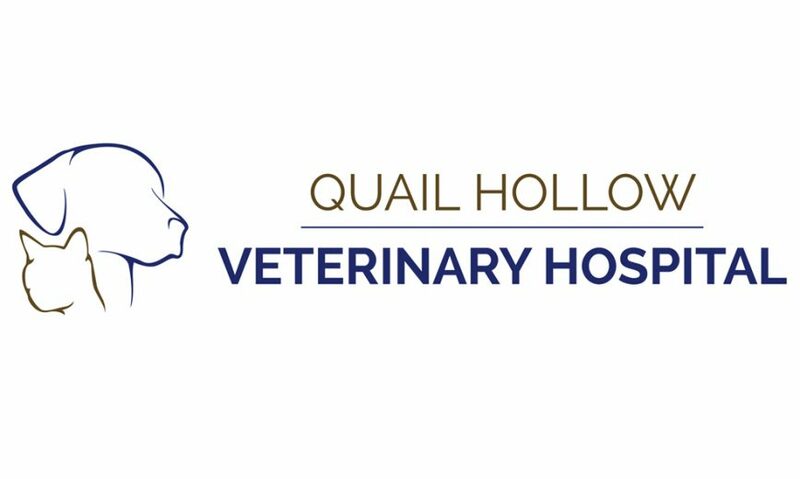 He is thrilled to be fulfilling his dream of founding his own practice with the opening of Quail Hollow Veterinary Hospital in 2015. Dr. Berman’s clinical interests include wellness and preventive medicine, clinical nutrition, and dermatology. He is an active member of the American Veterinary Medical Association, the American Animal Hospital Association, and the North Carolina Veterinary Medical Association. In his spare time, Dr. Berman enjoys family time with his lovely wife Ivy and their young daughter and son. His four-legged companions include two rescued Labrador retrievers (Sophie and Emma) and an adopted kitty cat (Pookey).